Across the last 18 months Google and Ebay have been experimenting with applying their systems to traditional media planning and buying in the USA. The Ebay Media Marketplace is a well established trading system in the US and uses Ebay auction mechanisms to trade TV space and short term radio inventory. 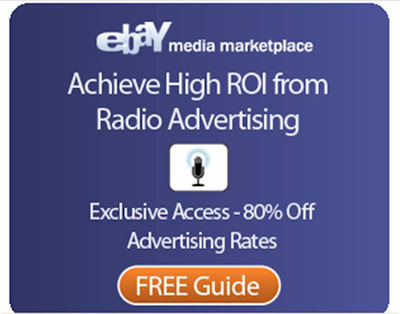 Ebay were pushing a free pdf guide to the Ebay Media Marketplace Radio trading system and it is interesting to look at the language used 'High ROI' being the focus. Google have also tried to branch out in a number of areas. Google's 2006 acquisition of the DMarc US radio trading system allowed the application of dynamic auction modelling to traditional space. In 2007 Google started trading TV spots by using their auction mechanisms to trade spots for US satellite pay-TV provider Dish TV and Google have also experimented with extending the reach of Google Adwords by running ad space in newspapers / magazines through the Google Print program. As digital media becomes ever more efficient, through Ad Exchanges and auction based trading, there is an inevitability that offline media will start to be traded through similar mechanisms. So far the majority of the beta testing and experimentation (with applying online trading methods to offline media) has been within the US market, but there are signs that this is moving into the UK. These are intriguing moves and it will be interesting to see how these developments effect offline UK planning and buying.